It’s expensive: As if the exorbitant amount of your initial capital expenditure wasn’t enough to put you over budget, the ongoing operational expenses are getting worse with each passing month. It’s time-consuming: Your IT team is spending the majority of its time tending to your network, trying to ensure uptime and performing patches and updates. As a result, it has no time to devote to higher-level tasks like integrating next-generation technologies across the enterprise. It’s unreliable: Have you lost track of the amount of system downtime that you have accrued over the past year? Every time your system crashes, your entire business is affected—from sales and marketing to the C-suite. With these challenges in mind, it should come as no surprise to learn that the alternative approach, the managed services market, is experiencing such widespread growth. In fact, the global managed services market will increase from its 2014 level of $107.17 billion to $193.34 billion in 2019. Why are so many businesses investing in managed services in favor of costly and burdensome legacy networks? It’s because when you invest in managed video conferencing services, webinar services or data management, your business is no longer responsible for monitoring your network for upkeep and stability; that responsibility now falls into the hands of a third-party provider, effectively saving your business valuable resources. 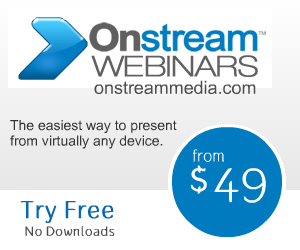 Click here to learn more about Onstream Media’s approach to managed services.